This morbidly amusing headline reminded me of the supposed corpses I wrote about on The Dead Bell, but only for a second. It’s a bit of a stretch to think that a body could remain in suspended animation for four months, especially in 1910. 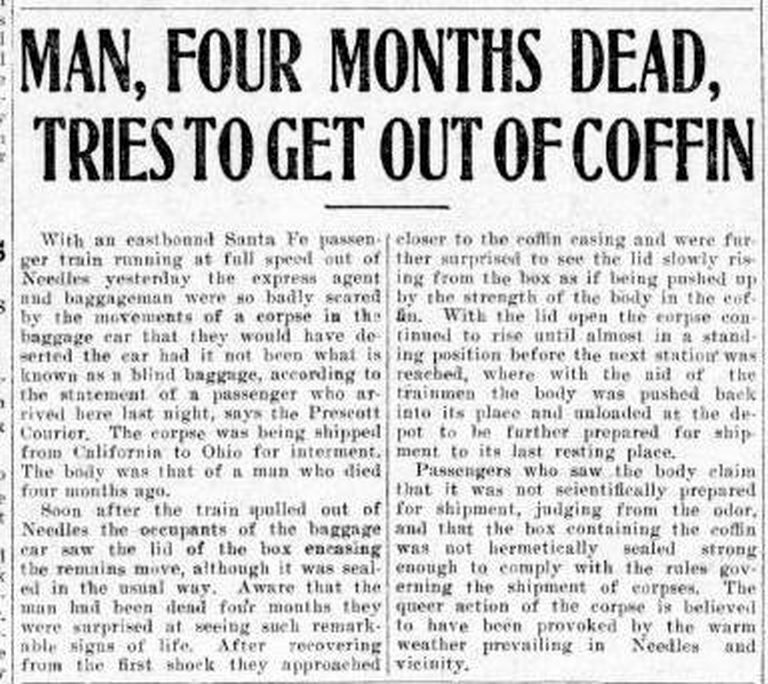 The story is about a man who was really dead, appearing to rise from his coffin while being shipped across the country for burial during hot weather. Personal details about the corpse are omitted from the article so the reason why there was a four-month interval in between the time of death and burial is open for speculation. Perhaps the man had died and he wasn’t discovered or his identity was unknown for several months. When he was originally embalmed would also be interesting to know, even though people who witnessed him “get up” didn’t think he’d been embalmed properly. States had public health laws in regards to shipping corpses on trains that governed aspects such as how the body was embalmed, the type of coffin in which it was shipped, and the time it would take to get to its final destination. Many railroad companies required a living person to purchase a ticket (in addition to the “corpse ticket” for the body) and also make the trip to assume liability for the body. This article doesn’t mention whether or not there was anyone on the train who knew the deceased. With an eastbound Santa Fe passenger train running at full speed out of Needles yesterday the express agent and baggagemen were so badly scared by the movements of a corpse in the baggage car that they would have deserted the car had it not been what is known as a blind baggage, according to the statement of a passenger who arrived here last night, says the Prescott Courier. The corpse was being shipped from California to Ohio for interment. The body was that of a man who died four months ago. Soon after the train pulled out of Needles the occupants of the baggage car saw the lid of the box encasing the remains move, although it was sealed in the usual way. Aware that the man had been dead four months they were surprised at seeing such remarkable signs of life. After recovering from the first shock they approached closer to the coffin casing and were further surprised to see the lid slowly rising from the box as if being pushed up by the strength of the body in the coffin. With the lid open the corpse continued to rise until almost in a standing position before the next station was reached, where with the aid of the trainmen the body was pushed back into its place and unloaded at the depot to be further prepared for shipment to its last resting place. *This entry was originally published in April 2013.